Khao Yai farm village is not a real farm village, but more like a theme park that let you be a “farmer” for a day in the most convenient way, where you can learn about farming, cooking, having fun and interacting with animals, and the farm is undeniably photogenic and fun for kids too. There are 2 main areas in the farm, which are the farm activities side and the sheep village, where all the animals are let free to play and mingle with the visitors. Although the entrance fee is only THB 100, but you need to pay a fee in order to join in certain activities. If you are a selfie enthusiast, this farm will be your haven too, because they have a well-organized and managed plantation, so that you can selfie with fruits and flowers easily. They offer several farm activities for an extra fee. All the activities are well organized in their respective area, clean and nicely done. They even make the process of breeding earthworms sounds fun. The pumpkin farm is so iconic that is difficult for you to miss. We were at the Pizza workshop to do the clay oven style pizza with abalone mushrooms. This activity will cost you THB 200 where they will be prepared all the ingredients and let you bake your own pizza in the clay oven. Once your pizza is done, you can either enjoy it on the spot or just take it away. After finishing all the fun activities, is time to have fun with the animals. By entering the Sheep village, you need to go through the sanitizing process to protect the animals in the farm. 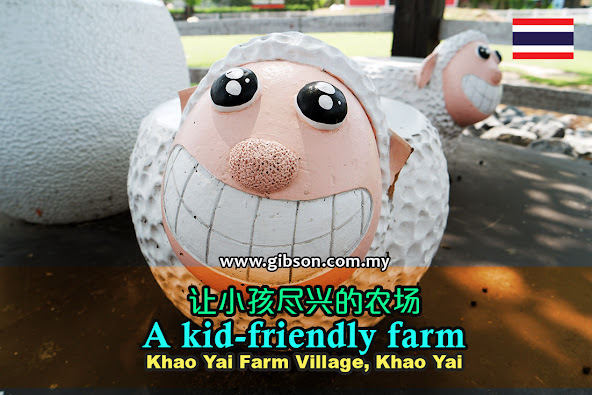 In sheep village, there are 4 areas to explore namely sheep farm, sheep house, rabbit farm and cow farm. All the animals are let loose to roam freely here, so you can get real close with them. If you like to let your kid to have some feeding fun, the treat counter is always at your disposal. We all loved the rabbit here, they are just adorably cute. The resting area is decorated with furniture that made of farm tools. They even have a wheelbarrow table!